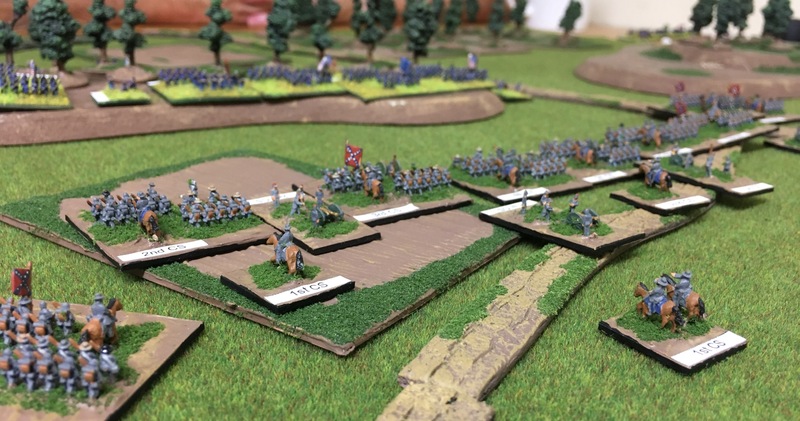 Having been held by a determined defence along Praxton Creek on the 23rd August General Lee gave Major General John Pope the slip during the night and flanking the Union position continued his advance north. Pope, ordered the Union army north trying to keep his army between Lee and Washington. Lee for his part was spoiling for a fight and with his army relatively concentrated turned on the 25th of August to strike advanced elements of the Union Army of Virginia. With Confederate scouts reported the Union forces were generally strung out in line of march. Lee determined to strike swiftly, with a portion of his Army of Northern Virginia attacking two Union divisions. While it was true the Union divisions had the advantage of high ground Lee was determined to retain the initiative. His army was divided into two commands of corps size, one under Longstreet and the other under Jackson. For the forthcoming engagement Longstreet would be able to call upon four divisions, some ten brigades. Jackson would support this with two further large divisions, another eight brigades. Stuart would also add his small cavalry division to the attack. In all General Lee would be able to commit some 30,000 infantry, 2,000 cavalry and over 72 guns to the attack. Above and below the Confederates approach the Union forces deployed on Weaver Ridge around 3pm. From left to right are Anderson’s, Jones’ and Ewell’s Divisions. Union forces on the ridge are the 1st and 2nd Divisions from McDowell’s III Corps, Army of Virginia. Lee moved his army forward in three general bodies. Anderson’s Division would pin the two Union Divisions in place on the wood covered high ground locally known as Weaver Ridge. At the same time Jones’ and Ewell’s Divisions would slide to the right before moving against the exposed Union left and line of communications. Above Confederate artillery, comprising rifled and smoothbore guns, form a massed battery of 36 guns and begin to bombard the Union left. 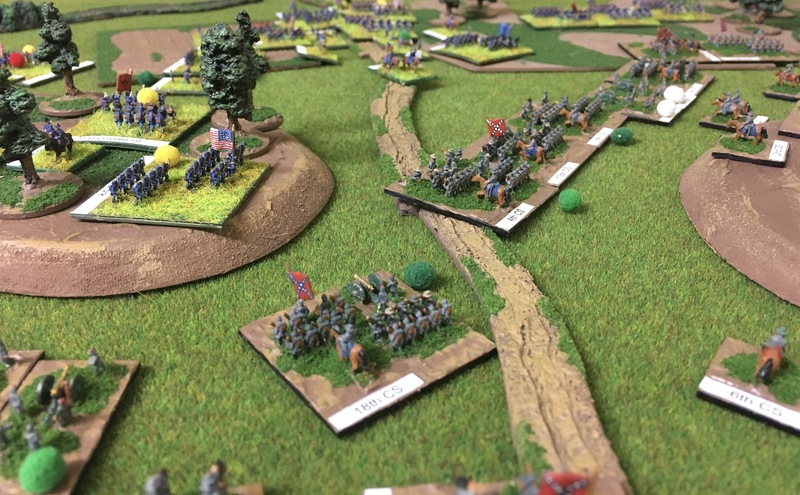 Simultaneously the Ewell’s Division begin their attack moving swiftly forward. 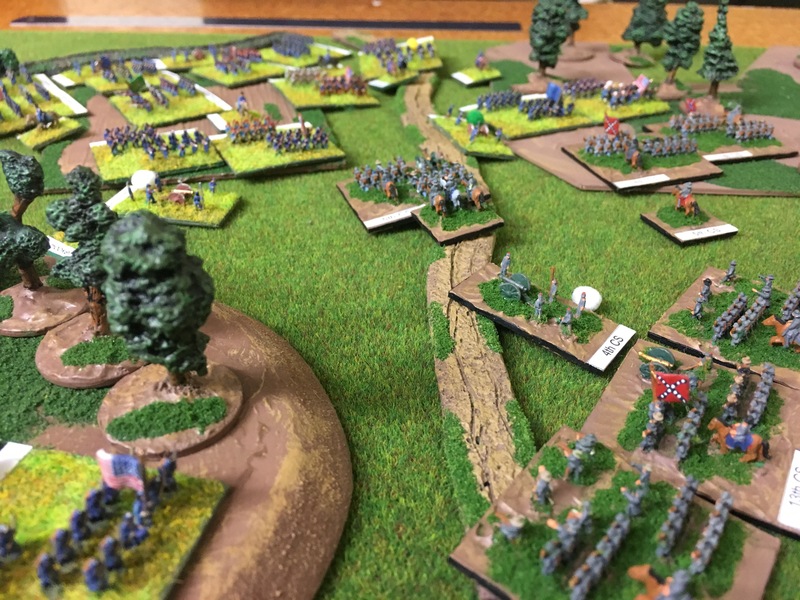 Forno’s Brigade attacks Union guns while Lawton’s Brigade is advancing astride the Kylertown Pike, the main route of advance for Union reinforcements. Five additional brigades extend the Rebel right. The divisions of Hood, Kemper and Stuart, all relatively small and forming the Confederate left flank, move from the Rebel left and advance on Weaver Ridge from the left, flanking the position. 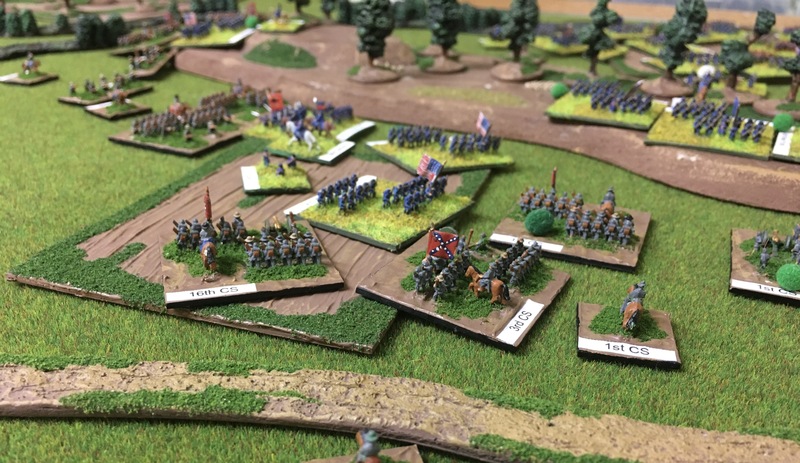 Below, the Confederates advance against the Union right, holding the extreme Union right of Weaver Ridge. By 5pm the Union reinforcements were arriving. First to deploy was Siegel’ I Corps. No sooner had they deployed these two Union divisions faced another attack, under the watchful eye of General Lee. Below, the Forno’s, Toombs’ and Jones’ Brigades are in the foreground while in the distance Early’s, Lawton’s, Trimble’s and Drayton’s Brigades attack. While Lee was in the thick of the fighting Jackson moved along the line encouraging troops of Ewell’s Division. “Move swiftly, strike vigorously! These Yankees will break!” Despite the rapid Confederate advance additional Union reinforcements were now pouring on to the battlefield, primarily from Heintzelman’s III Corps, Army of the Potomac. Now increasingly outnumbered the Rebel attack on the right began to stall. Lawton’s Brigade was first to crack. Below, the Rebel brigades in a sea of blue around 6pm. Meanwhile in the centre, the Union 1st Division had earlier abandoned the safety of Weaver Ridge and advancing through the cornfields attacking the Rebel centre. Below, two Union brigades, along with US Sharpshooters advance on Armistead’s and Mahone’s Brigades, both part of Anderson’s Division. Mahone’s Brigade, shown below on the Confederate left, suffered heavy casualties over two hours of desperate fighting. Yet Longstreet was feeding in troops. Three Confederate Divisions crossed the south branch of Otter Creek about 5pm. Below, in the foreground, is Hood’s Division, which comprises Hood’s Texan and Whiting’s Brigades. In the distance Kemper’s Division, comprising Kemper’s Brigade and that of Jenkin’s Brigade. Between them are Fitzhugh Lee’s and Robinson’s cavalry brigades from Stuart’s Division. Now, around 6pm, the exposed Union Division in the Cornfield, is hit from two directions. In the rear by Hood’s Division and from the front by Garrett’s Brigade from Taliaferro’s Division (Jackson’s Corps) and Wright’s Brigade from Anderson’s Division. Hood’s Texans in particular gave the Yankees a surprise, attacking with great élan. 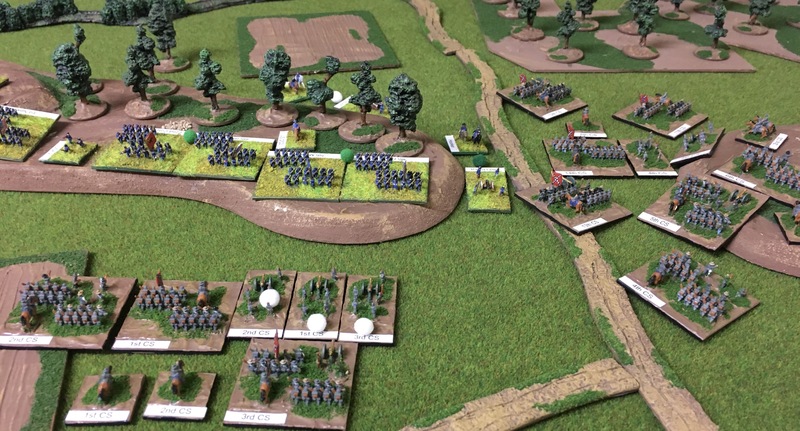 Below, the Union 1st Division defends the Cornfield. 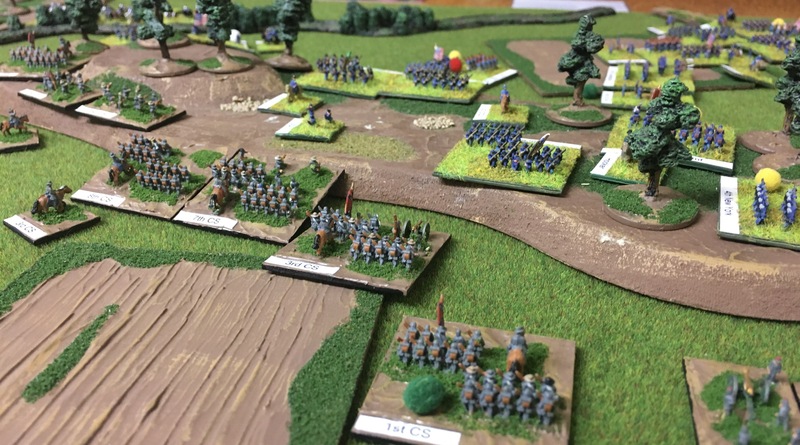 While the action in the Cornfield plays out the two brigades of Kemper’s Division attack the final Union brigade holding the Union left supported by Fitzhugh Lee’s dismounted cavalry brigade at 7pm. The combination of all these attacks on the 1st and 2nd Union Divisions were disastrous. Both divisions were driven back in disorder having suffered crippling casualties. However, Union reinforcements continued to deploy including extending the Union right. 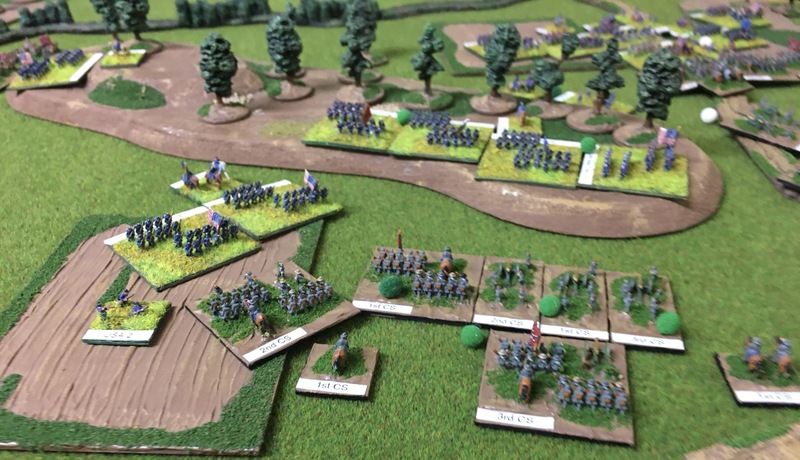 Below, two Union infantry brigades prepare to counter-attack while Pleasanton’s cavalry, some three brigades form behind the northern branch of Otter Creek. Further along Weaver Ridge the shattered Union centre began to be reinforced by another Union division around 8pm. With light fading Longstreet ponders a further attack. Anderson’s Division is itself however nearly exhausted. Any final push would need to be by Hood’s Division, on the left, or Stuart’s dismounted cavalry far left. On the Confederate right, below, the attack by the southern brigades had stalled earlier and now prepared to face a possible Union counter-attack. Ewell’s Division was exhausted though Jones’ Division remained fresh. Several disordered Union regiments can be seen on Weaver Ridge. There was no doubt General Lee was pleased with his troops aggressive spirit and determination to advance. The Southerners had fought hard and pressed the Yankees at every turn. One Union Division had collapsed and another exhausted, giving Pope grave concern. However, yet again the hoped for destruction of the Union forces was not complete. The Union army had held. 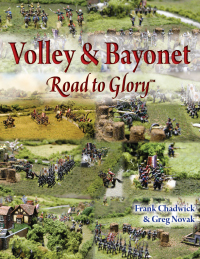 The scenario was of course another fictional encounter developed using the “Road to Glory” System with each army comprised of 3000 points. The Union commanders had selected “Advance Guard – Echelon Centre #5” while the Confederate commanders selected “Returning Detachment – Reserve #20” and therefore had the burden of attack. 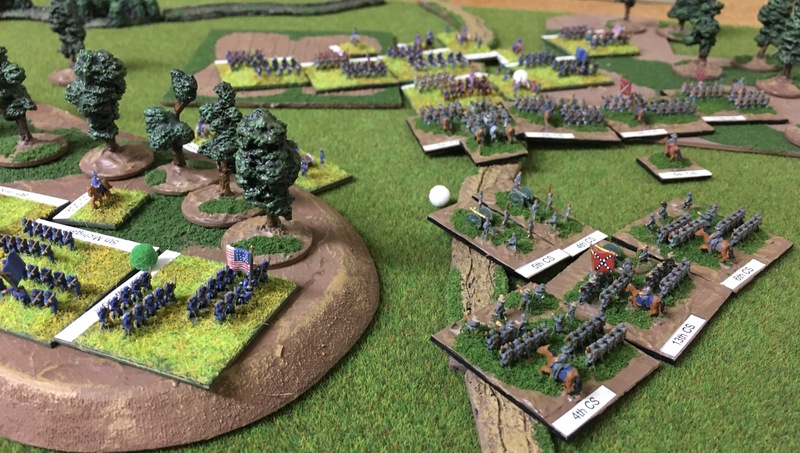 Miniatures are all from Heroics & Ros 6mm range, with the Confederates from my collection while Jon provided the Union forces. A great encounter and a damned fine game suh!!! Thoroughly enjoyed it.